I’m going to come clean: I am not a big fan of traditional ‘budgeting’ (*GASP*). You know, the thing where you have to write down everything you spend and then compare it to a pre-determined spending limit for each category of expenses (‘Did I spend more than $100 on clothes this month? Oh no, I spent $150!’ *insert guilt*). I’ve tried it before…and it lasted a week. It’s tedious, it’s laborious and it always makes me feel bad about myself. Honestly? That’s not the kind of relationship I want to have with money. So why does everyone talk about creating a budget then? While you don’t have to detailed budget, you should have a basic understanding of how much money you’re spending and on what. 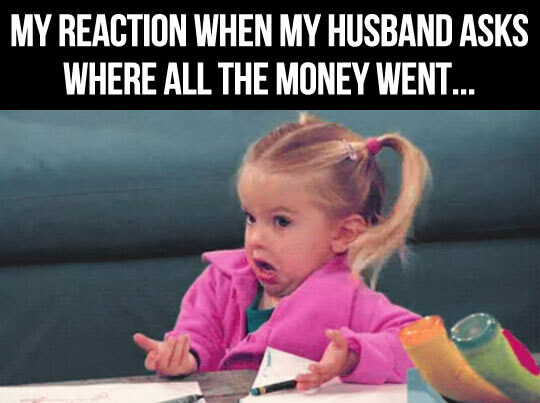 If you ever go to a financial planner, one of the first things they will do is figure out where all your money is going. This bit is REALLY IMPORTANT. Seriously. Most people have no idea where there money goes. Okay, so how do you think people did this pre-internet, and pre-online banking? By….writing everything down. It was the only way they could keep track of what they spent. But those days are GONE. Anyone who tells you to manually write down everything you spend is living in a previous century. Seriously. 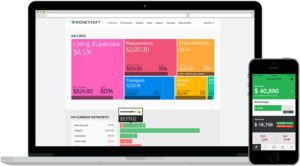 This is one of the bigger and more comprehensive budgeting and tracking tools in Australia. The great thing about MoneyBrilliant (compared to other alternatives) is that they are really trying to capture your end-to-end financial picture: not just collecting your expenses from your bank transactions and credit cards, but looking at your super and your investments so that you have a complete picture of your finances. Their tool also has features that help you work towards your financial goals, and of course it has an inbuilt budget. It also helps you manage your bill payments as well. So…it’s pretty comprehensive! AND…they have a MoneyBack Guarantee: They assert that “if we can’t find ways for you to save, or make at least the subscription fee in 12 months – we will give the money back”. That is pretty bold. I do love a good Money Back Guarantee! It’s also worth mentioning that a few years ago, AMP bought MoneyBrilliant. Does that make it more ‘secure’ because it’s owned by a big corporate? Who knows, really. So PocketSmith is actually a New Zealand company, but they do have coverage and offerings in Australia, so I wanted to put it here. I’d put PocketSmith above PocketBook (details below) but below MoneyBrilliant in terms of the features and comprehensive level of of analysis it is able to provide. 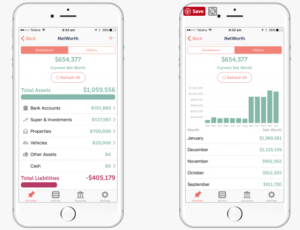 The user-interface and capability of PocketSmith are way better than Pocketbook — it allows you to create budgets, income statements and balance sheets, and it has good reporting (analysis of your money situation with charts and things). It also allows you to add in other users (e.g. if you’re a couple, or want your advisor to have access). But, it doesn’t come with a lot of the bells and whistles that MoneyBrilliant does (like incorporating Australian super, property, goal-setting etc). Price: There are 3 options: free, $9.95/month, and $19.95/month — it depends on what features you want. You can always start out with the free version and upgrade, as well. So, this one is popular with financial advisors who use it with their clients…but as an individual, it’s a bit expensive compared to other alternatives: $20/month! 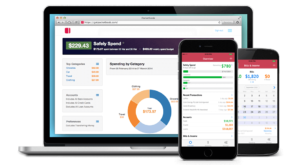 I don’t know why this budgeting tool is more expensive (double the cost) of tools like MoneyBrilliant. It seems to do the same job — automatically downloads your transactions, helps you categorise them, helps you measure them against a budget, allows you to track and see your progress towards goals…all pretty standard. Their user interface is alright, not as pretty as MoneyBrilliant, but definitely better than PocketBook. If you want something more simple, with less frills and fancy options — Pocketbook is another Australian budgeting app that could be the way to go. This is more appropriate if you’re looking for a basic tracking and budgeting tool. The user-interface and capability of this tool is way more basic than the others mentioned above. They bring all your transactions into one place to help you see where you’re spending your money, and you can also analyze the transactions (categorise them, see pretty charts etc)…but they don’t do things like: bring in your superannuation accounts, comprehensive goal-tracking, tracking investment income etc. It does have a cool tool to help you find tax deductions though! Price: Free to sign up. There are certain features in the tool that you need to unlock by either inviting a friend, or ‘donating’ a few dollars. These tools are a lot more simple: instead of reading your bank transactions, they just allow you to type in all your expenses manually and use that data to provide some reports so you can easily see how much money you’re spending, and on what. These tools do not require you to give access your accounts! Woo hoo! So if you’re a stickler for security and cannot deal with the thought of some third party looking at your bank transactions, these tools might be for you. 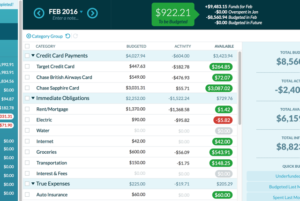 You Need A Budget (YNAB) is for you if you love the old school style of budgeting. It’s a great upgrade from your spreadsheet. 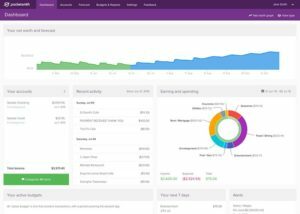 It allows you to create a complete budget, and then you can manually enter your transactions as you go — and it will scoop all that up into neat little reports so you can see where you’re spending most of your money. It also pulls your data into income statements and balance sheets. YNAB does offer syncing with banks but it’s limited to American banks for now. On a side note, YNAB also produce a lot of free content about money and personal finance, so check out some of their educational material. Just keep in mind that YNAB is an American company, so some of their content might be more suited to American audiences. Price: $50/year. That’s like…less than $1/week. Not a bad deal, if you ask me! 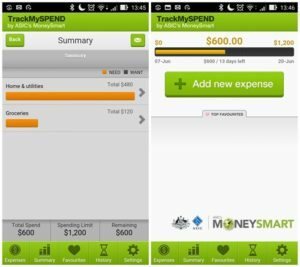 TrackMySpend is a budgeting app created by the Aussie government. Before you automatically write it off… I’m actually pretty impressed, it’s really pretty neat. Like YNAB, it requires manual entry. The interface and capability is a lot simpler than YNAB, but I think this is appropriate for the app. It’s not designed to spit out comprehensive or detailed income statements, it’s literally just a tool to help you write down your expenses so you can see where your money is going. If you’re really fresh to this whole budgeting and tracking thing, this could be a good place for you to ease into it. Some banks have their own money tracking/savings/budgeting tools and apps. I know that Commonwealth Bank of Australia (CBA) have the MySpend and NetBank tools. So, make sure you check whether your bank already offers a tool that meets your needs! So those are the popular budgeting apps and expense tracking tools available for Australians at the moment. The initial set-up can take a bit of time (getting your accounts linked, categorising your expenses etc), but once you get in the flow of it, it becomes a lot less painful and time-consuming. Be strong, don’t give up after a week! It’ll be worth it, I promise. Do you have experience with any budgeting or expense tracking apps or tools (whether it’s one above, or something different)? Comment below, I’d love to hear about your experiences! Liked this? Get more! Sign up to our weekly newsletter here. Hi Lorraine, You might like to start with something simple like You Need A Budget, which allows you to manually insert all your expenses. YNAB also has a lot of resources to help explain the budgeting process and how to make it work for you. I hope this helps! I friend recommended Pocketbook but I am cautious of anything that’s free! How do they make money? Can they use my data? Hello! Thanks for this great list! Do you have a recommendation for spend tracking where I can upload files manually? I like the User Interface of MoneyBrilliant but they don’t seem to allow your to upload your transactions manually (don’t want to provide them my bank login details). I had a look at PocketSmith which allows you to upload files manually but I found their User Experience a little lacking and confusing. Hey Dru, you can contact MoneyBrilliant directly because I believe there is some work-around that they can help you with (or they may be happy to help you do it manually). Ultimately though, they are designed to sync to a bank feed. If you’re not comfortable sharing your bank details, you may want to consider YNAB or TrackMySpend which are more manual and don’t require you to provide bank details 🙂 Hope this helps! Is there a programme that you can upload your previous bank and credit card statements into and get an analysis of your spending for the last 12 months ? I like the look of MoneyBrilliant however I will be liable for anything that happens if I give out my log in details (ING Direct). Hey Darren, so in terms of liability you’ll have to check the policy your bank has. Many banks do say in their T&Cs that sharing passwords is against their policy and therefore if anything happens as a result of sharing your password, you may not have recourse through your bank. So there are some people who don’t feel comfortable with the security risk. In terms of past bank statements, I believe PocketSmith allows you to upload historical data and MoneyBrilliant does for some banks as well. 🙂 Hope this helps!